A collimator is the first processing layer of a gamma camera to encounter photons from radioactive source. It restricts the rays from the source so that each point in the image corresponds to a unique point in the source. Collimators are composed of thousands of precisely aligned holes (channels), which are formed by either casting hot lead (Micro-cast) or folding lead foil (Micro-linear). A radioactive source emits gamma ray photons in all directions. The collimator conveys only those photons traveling directly along the long axis of each hole. Photons emitted in other directions are absorbed by the septa (wall) between the holes. Without a collimator in front of the crystal, the image would be indistinct. 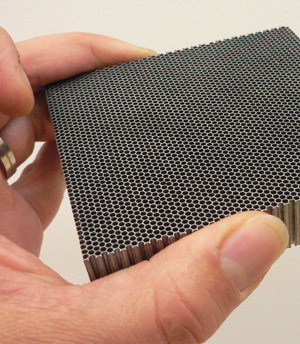 The surface of a collimator core looks much like a honey-comb with hexagonal holes. You won't be able to see this with a finished products, because the delicate structure of the core is protected on both the patient and crystal side by a laminate cover. The patient side is also equipped with a protective collision cover. Nuclear Fields also manufactures square-hole collimator cores to accommodate pixilated crystals used with solid state detectors. The precision of our Micro-cast collimators starts with computer generated photo-plots of a hole-pattern, which will be transferred on to metal templates. Transfer is done using a process of two-sided photo-etching of the templates, all within tolerances of 0.005 mm. The etched templates are basically used to align the special alloy pins that need to form the tunnels and septa. One set of etched templates is mounted into a mould. Thousands of pins are loaded in, the mould is then closed and chemically treaded molted lead is poured in. A special cryogenic process allows for a quick cool down. This step is important in controlling the shrink factor. The last step is removing the pins and templates and then the "raw" core is machined down to the right core thickness. If necessary, steps around the cores to accommodate the collimator ring can be made as well. The nature of our casting technique provides the flexibility for individualized fine-tuning of every collimator, with a nearly unlimited number of unique design possibilities; low to high energy, high resolution or high sensitivity, parallel or slant-hole, fanbeam, conebeam, etc. Nuclear Fields had engineered its own lead foil-constructed collimator, named Micro-linear. To guarantee consistent quality, our production is from start to finish fully automated. With an in-house developed machine that has nine axis computer controlled robotic movements, we are able to produce high volumes of low energy parallel hole collimators. With this new foil technology, we were able to overcome misalignment and tunnel deformation issues commonly known with traditional foil collimators. Foil constructed collimators are basically corrugated foil strips stacked on top of each other, forming hexagonal shaped tunnels. Tunnel walls that are glued together are half thickness, which is intended to provide tunnel walls of equal thickness at all sides of the tunnel. Unfortunately, when this type of foil strip is miss-aligned, substantial areas of the tunnel wall has only half the thickness loosing its shielding capability thus increasing septa penetration. This effectively reduces your resolution and uniformity. With our new Micro-linear technique, misalignment and tunnel deformation is virtually impossible, since the stacking and alignment is now a fully automated process where measurements are taken during every step of the process. Through this we have been able to work with tolerances smaller than 0.002mm (2 micron). Essential design difference with traditional foil collimators is that the Micro-linear foil strips have a small arch pressed into the horizontal tunnel walls, so it self-aligns during the stacking process and stays in place. With this new technology Nuclear Fields has set the new standard in quality and performance for foil constructed collimators. It is critical that the structure of the collimator does not impart any distortion, artifact or other error to the procedure. Our Micro-cast and Micro-linear production techniques produce a structure of precisely uniform septal wall thickness, tunnel shape, linearity and angulations. Nuclear Fields collimators are guaranteed to have a maximum hole angulation tolerance of under 0.25 degrees of arc across the entire field of view, also at the edges of the core. Our collimator uniformity closely matches the intrinsic resolution of the camera. These facts translate to an increase in resolution of the gamma camera. That's why Nuclear Fields is known for delivering the highest standard of collimator quality in the industry. Unfortunately the simple NEMA test for collimators is not sufficient to distinguish good quality from poor quality collimators. To overcome this, instead of the flood source test, use a 5 mCi point source 5 meters (15 ft) away from the face of the collimator. This will determine very quickly the quality of your collimator!